We can raise children to think of others first and to serve—not necessarily to serve in the military, but to think beyond themselves. And we don’t have to be Helicopter Moms or Tiger Moms—we can support our children without plowing the way for them or being their taskmasters. We can encourage their dreams and also use the power of natural consequences so children have confidence in themselves and don’t shrink from the hard stuff. We need a generation who can stand up to evil in the world wherever it is, much like the greatest generation did 70 years ago. I believe in the power of dreams and encouraging children to work hard to achieve those dreams no matter how outlandish they may seem. Call me a Dreamkeeper. That’s why when my kids say they wanted to climb a ridiculously high mountain or fly way too close to the ground I close my eyes, take a deep breath, and say go for it. Passion creates a desire to be excellent that no amount of parental nagging can replicate. Helping kids find a passion and supporting it is the key to being a successful parent—and if that happens to be doing scary things how can I get in the way? The difficulty that comes for many moms is two-fold. 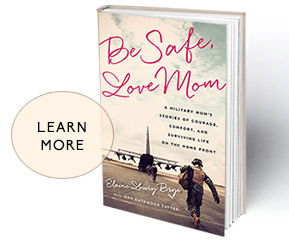 Often “losing” a child to the military comes at a time when a painful shift in the mom’s parenting role is already taking place. She goes from doing everything she can to keep her child safe to losing absolute control and having that child go into some of the most dangerous situations imaginable. AND her nest may be empty for the first time. It is a dramatic change. My biggest piece of advice is to take charge of the experience. You have to be strong to cope and that means you have to train and become your best self, too. Don’t just react. You can make the best of this difficult challenge and use this time to become stronger. The general public can help by making sure the resources are there to take care of the young men and women who have given so much. That funding for long-term services is there for caregivers, mental health, and brain research to support our wounded. They cannot be forgotten like the Vietnam generation. On a personal note, if you know a military family, ask about their service member and expect to listen. Offer to write, send a package, do something. Many of us moms feel like people don’t really understand the burden we carry or why we worry so much. It’s why we immediately feel a bond with each other. We know we are all just one phone-call away from life changing forever.